Do you ever get stuck with having to make something and not wanting to drive to the store? I have a pal I call the “bottom of the fridge” chef. She manages to make something wonderful with food laying around her house. I envy her creative streak. I was stuck without the ingredients for the post I was going to do today, so I started looking around my kitchen. Voila! I had ingredients for a three layer dip. It helps to have a pantry that has healthy food already stocked in it so you don’t have to go anywhere. I believe that these dips usually have five layers, but who needs five if three tastes really good? To make it healthier than the usual, I used much less cheese and dropped the sour cream entirely. I found it was flavorful without any sour cream, though purists will have an issue with this choice. I always have a few cans of beans laying around. Avocadoes were only $1 so I had an extra one, and I had some leftover fresh tomatoes that needed to be eaten. Delicious! I don't have a better word to describe this fabulous recipe! This looks great, can't wait to try. 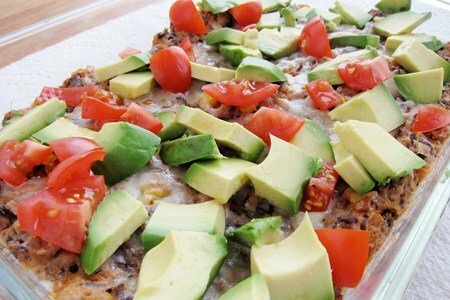 Great alternative to the refried beans. Looks d-lish! How do you keep the advocados from turning brown (like if you sat this out for a party)? Yummy! This dip looks amazing! Great flavor combination!! @Jenny - I would use some lemon juice over the avocados - it would add flavor and keep them from turning brown. Thank you for the question! Jenny - if you lightly toss them with some lemon juice they will stay green and the lemon adds a nice kick to the dish. Thanks for your tips and encouragement! If you want to kick it in another direction, add a little apple cider vinegar to the beans. This looks really good and I will definitely try it. (I would probably mash up the avocado with some salsa as well for easy guacamole, but that's just me). Amy - thanks for that tip I just bought Braggs Apple Cider vinegar and need ways to incorporate it into my meals. @Janet - I have not shared a pantry list - but now I will - I don't want you to get in trouble :) I am aiming for the second week in February so check back. Having a well-stocked pantry is always a must! Thanks for the recipe...looks great! All I can say is - Yum! And .. make sure you go to your grocery store and pick up avocado's before Super Bowl Sunday. One year there was not an avocado to be had in the product section :-( Totally sold out. Lately I've been subbing plain, low-sugar, high-protein Greek yogurt for sour cream. I use it in dips and on chilis and baked potatoes. Might be good for this dip, for those who have to have sour cream! My husband is a beanaphobe, so I really mash the beans till he can't see them. (Good exercise with the spud masher!) We've eaten this all week with quinoa sometimes or wrapped in a Smart Tortilla. He loves it! Ha! I just discovered Snack Girl this week! You are AWESOME! So many great ideas! I love hot or mild banana peppers on top of this dip! And cilantro if I have it! Very , very good !